Vredestein Banden B.V. is an Indian tyre manufacturing company that was later renamed as Apollo Vredestein B.V. The headquarters is located in Netherlands. The company manufactures different types of tyres such as all- season, summer and winter tyres for all types for vehicles. Vredestein aims to provide high- quality tyres with innovative technology to its potential consumers. The company believes in creating a green environment and all its manufacturing operations are done in an environment- friendly manner. Most of its tyres are designed by a well- known Italian tyre designing firm, Giugiaro Design. The company manufactures unique designs of tyres. Vredestein Ultrac Sessanta is an ultra- performance tyre that belongs to the category of summer tyres. The tyre consists of wide grooves that enable the water to flow while driving the vehicle through wet road conditions. In this way, it prevents any danger of aquaplaning. The asymmetric tread design of the tyre provides better traction. The tyre offers excellent short braking distance and handling performance, thus improving the vehicle’s maneuverability. The external shoulder blocks of the tyre consist of tread blocks that provide excellent cornering performance. Vredestein Ultrac Sessanta is available in many sizes which includes: Vredestein Ultrac Sessanta 225/ 45 Z R 17 94 Y - The tyre has a noise decreasing system which allows a quiet ride. 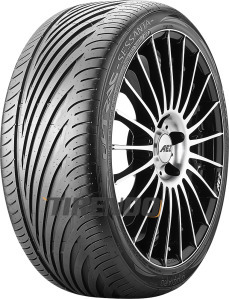 Budget- friendly, the tyre provides a smooth ride at high speeds in all types of road conditions. The tyres go through a lot of tests before being distributed to the automobile markets.